In February, 2o16 I traveled back to India, stopping over in Sharjah, United Arab Emirates first, to be part of the First Arts Conference at the University of Sharjah, which is outside Dubai. Organized by the Prasad Foundation of Oakton Virginia,(which sponsored my and others travel and participation), George Washington University, the University of Mississippi, and ATIC (Art Therapy International Centre) and the University of Sharjah. Presenters included art therapists from the UAE, USA, and music therapists from South Korea. I presented on the use of Playback Theatre and drama therapy to support communication in difficult times. In the next few blogs I will post some pictures to try to convey some of the experience of being in these interestingly cultural diverse countries. While Ive been back a month now, I find that the trip still rolls deeply in me and I continue to process. Below are a few pictures to describe my experience of being there. Near the university there were many gardens- An oasis in the middle of the desert. The flowers were beautiful. The university itself is beautiful, and well kept. Over 200 people attended this first event. It was both wonderful and heartwarming as the need and desire is clear to have more of this kind of training made available. Fortunately the university appears to agree. Dress varied from western style (long sleeve and skirt or pants) to Arabic and full Burqa for women. I really love the architecture of the UAE. Not the most elegant picture, but I saw an awful lot of sand. On our tour to the Humanitarian Centre, A playground using all recycled materials! Hyun Ju checked it out. Evening time in Dubai. Sunrises and sunsets were clear, and pure, making great contrast between light and dark. Coming back from a 6 week trip is a lot to unpack from, emotionally and physically. 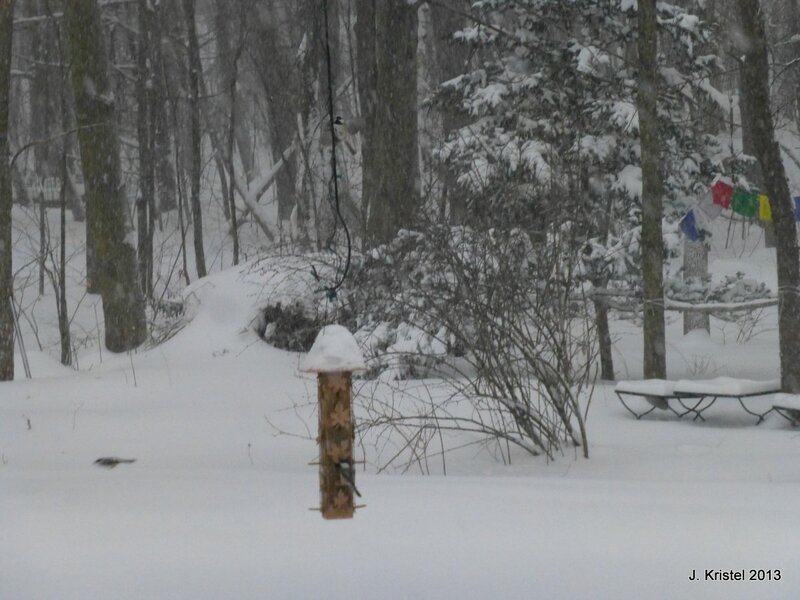 Today as I sit at my desk back at home, watching the snow fly outside my office window, I am thinking a lot about all the connections, places, people and events of all kinds that have happened in the last month and a half. I am aware that in being back in quiet Vermont, I miss the rich social connections that exist in Asia. There have been many threads of conversations on this trip that have entered and been woven through most if not all the trainings. I think the largest conversation was about gender issues, sparked in part by the killing of a 23 year old physiology student in Delhi last November. What it did do was provide the overdue and much needed catalyst for a world wide protest(one billion rising was born in the midst of the initial protests) and demonstration for Women’s rights and for holding all accountable for the ways in which women are not equal -in pay, work and social stature and safe from constant harassment and violence-domestic and otherwise. This theme was a constant- In all the trainings in both countries. In the process of teaching technique and form, we told stories, created art that looked at and witnessed the deep needs of both men and women, and allowed women the much needed space to state what it is that they need from their relationships, and their lives. What was palpable and important for me was the fact that while I was visiting another culture, there were so many similarities for us. The trainings were made richer by this as well as understanding the differences within our countries. In one session, during the Introduction to Art Therapy training through the East/West Center for Counselling, the women in my group, after seeing an intense documentary of women’s rights (or the lack of them) in India, pounded, cajoled and nurtured the clay as a group creating stunning art and talking about what their needs were, what they wanted for their lives, and in what ways they could go after their dreams. Other discussions were just as important. Climate change is on the list of high concern. Water shortages are everywhere. People are terrified by the prospects, and trying to make sense of it in real terms. Having enough water and being able to survive climate change is on the high priority list no matter which gender you are. Clinicians are aware of all of this. Right now clinicians, teachers, artists and others are all trying to find the right kind of tools to support people, to support themselves and to find a better way to approach being in our bitter and often challenging world. The tools themselves can be challenging to understand for cultural or other reasons. Helping people become grounded is the key in my work- To understand how to help others, one has to help themselves first. Diving down and deep, while at the same time creating an important toolkit to take to others supports this process. Teaching in an experiential way that makes sense, and makes the most impact is the basis of my style. In Hong Kong, through the Arts for the Disabled Association, the focus of the workshop centered around providing expressive arts to those with disabilities. My first question to those who participated was: How does one define disability? What does this really mean? How are we impacted or not by disability in our lives? Our culture? Climate change, gender disparity all entered the conversations. Cultural issues around caring for aging parents was also part of the deeper conversations.Before we could go further and talk about ways to approach working with those with disabilities, we had to break down the commonly held constructs of how we think about disability to begin with. For many this was a eye opening experience. Grounding the conversation with role plays, Playback Theatre, Art s based therapeutic techniques, students chewed on this over the week. They also experienced understanding stepping into the shoes of one with “disability”, painting with blindfolds, creating adapting tools to work with, exploring using these tools first for themselves and then to be able to translate it for using in their work. There is a lot to work through. In the end, I hope that somehow, people feel empowered in India and Hong Kong with enough tools to keep going. Since I last wrote, we have been traveling and working in chennai, India and Hong Kong. I taught 4 workshops or trainings in India, while Michael taught 2 and presented two other shorter presentations at the Aparreo Galleries in Chennai. Its been amazing, often intense, complex and very often very rewarding. Michael has been great about writing regularly- I not so much, as at the end of the day, I am tired enough that my brain can not organize thoughts to write. To see Michael’s blogs go to Dreaming the world to see about our trip from his perspective. We are taking a much needed few days off to rest up for our long trip and intense time change back home. While we are doing that, we are processing all from the trainings ( 2 3 half day trainings with college students at Ethiraj College and Madras School of Social Work) a 5 day core training in Playback Theatre and a 5 day Introduction to Art therapy as part of the Expressive therapies certificate program – a collaboration between the East West Center for Counseling and Women’s Christian College. 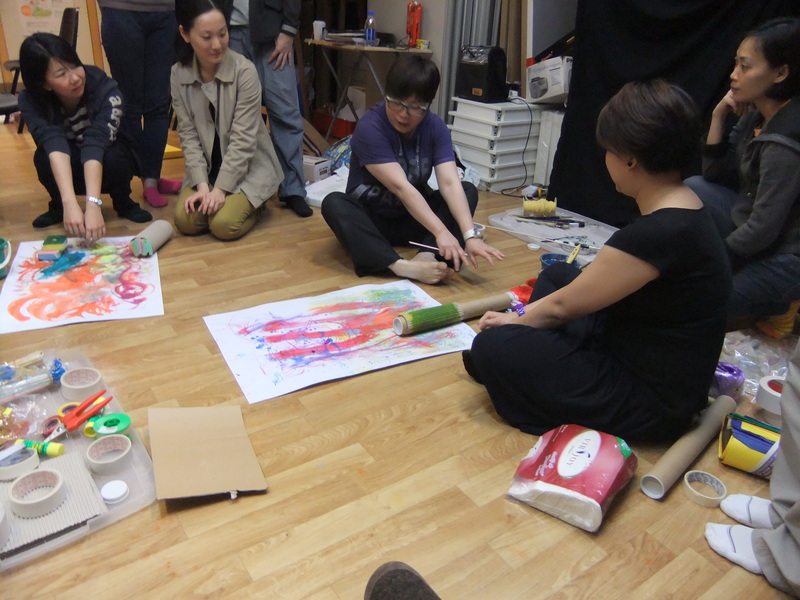 Then in Hong Kong, a 5 day workshop on using the Expressive arts with people with Disabilities. 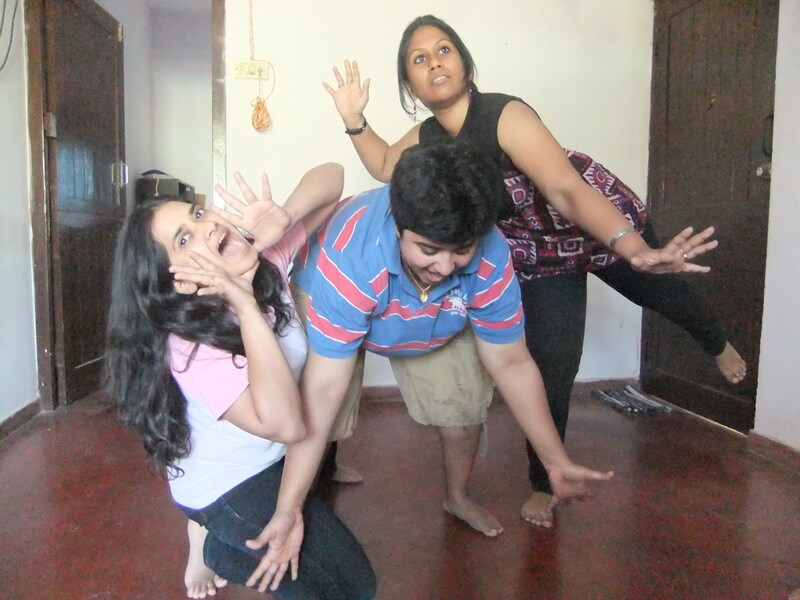 Last weekend we spent in Bangalore working with the Yours Truly theatre company. We also had the pleasure of meeting with Fausto And Elena, Playbackers from Italy. The weekend was one of connection between people from 3 continents, exploring themes that connect us all: culture, faith, and Playback . Our differing backgrounds created a rich experience. On Sunday, Michael and I led the troupe in looking at the issues facing them around gender. Many deep feelings arose as the group ask itself questions about their identity as men and women- looking for a way to be authentic, and for their voices to be heard. In the afternoon, we split up into two groups, men and women. In the women’s circle we share what it was like to desire our voices be heard, for us to be taken seriously, and for us to be able to have our needs met in this process. In coming back together, the men on one side and the women on the other shared their feelings and experiences. The men playing back for the women, and the women playing back for the men. In the end, the stories went very deep as group worked to truly hear each other through the veil of cultural and societal expectations and norms. This is a group prepared to lead the way to having their voices be heard. In the end, the women and men of realized their wants, hopes and needs were very much aligned. Well, once again, there has been a long time between blogs. Daily life, work, family and projects take up the psychic space that I need to think about writing a blog. Some of what I have been doing, I have done with my partner in life and career Michael Watson, who has been writing voraciously and beautifully. To read about his work I invite you to go to his blog here. It is cold here. It is supposed to be about 5 degrees tonight. Fahrenheit. I wrap myself in my Indian scarves and shawls to remind myself of the warmth of South Asia.